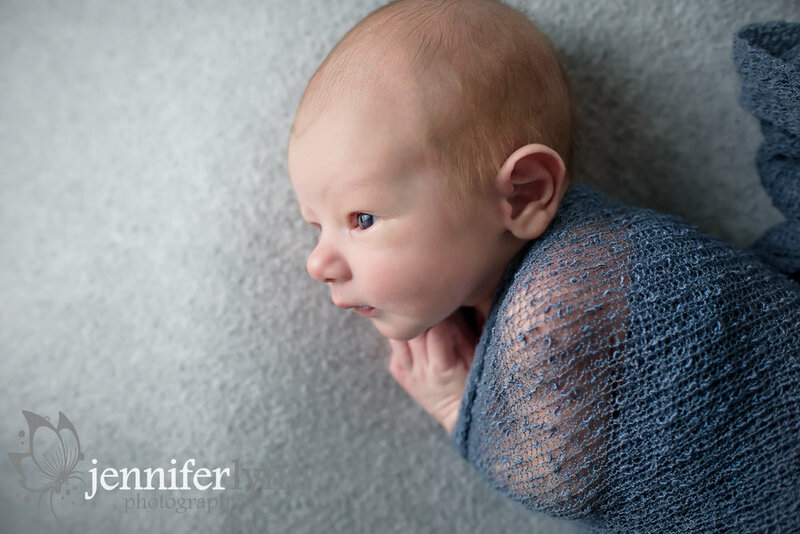 Austin came by this weekend with his parents and grandmother for his very first newborn photos. He was so precious, and he loved being on his tummy, curled up with his legs tucked underneath him. It’s always so amazing that you can really tell how a baby was scrunched up in utero just based on how they prefer to curl up during their newborn sessions! And Austin definitely wanted his legs crossed under him, whether in a bucket, on a prop, or on the bean bag. We got a great mix of classic boy photos with blue, grey, and white and then several fun holiday images with reds. His mom also brought in an adorable little reindeer hat that we used for a few bucket photos and some with my cedar sled. I then had fun adding in a few snowflakes that makes a cute birth announcement for this winter Christmas baby. Austin also now holds the title of “longest hiccups” ever in my studio! Hiccups are fairly common during newborn sessions, but they always wake up sleepy babies. They also tired them out, so afterwards babies usually go back to sleep after a quick feed. It’s just during the hiccups that the poor little ones are awake, and Austin had a long bout of them. I did get extra baby snuggles out of it, though, so I’m not complaining! I also took advantage of some awake images for mom and dad before Austin went back to sleep, and I’m in love with these showing off his big blue eyes. Thanks so much to his family for their patience during our literal hiccups during the session and then waiting for their sneak peek. Enjoy that precious little one and I look forward to sending you the rest of your gallery!